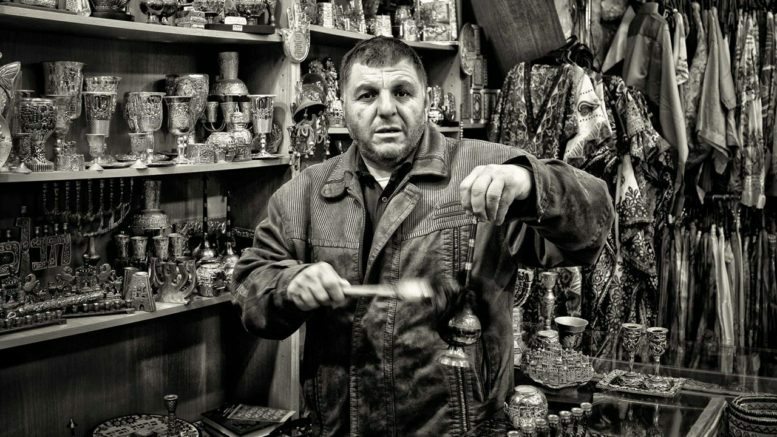 “Faces of Jerusalem is a documentary portfolio offering the viewer a journey to the Old City through its people. Their proud portraits reflect the rich culture and turbulent history of Jerusalem…”. So reads the artist statement of Ilan Wittenberg. The series of 35 monochrome images were the “clear and unanimous favourite” among judges of the 2016 Cathay Pacific Travel Media Awards. The idea of capturing the markets with modern merchants going about daily life, juxtaposed against a backdrop of millennia of history was born while Wittenberg was on a family holiday in the Holy Land. He returned on his own shortly after to explore the cobbled streets and shops of the Muslim, Jewish, Armenian, and Christian quarters. Wittenberg was raised in Israel and was able to engage with the merchants with the confidence that comes from an understanding of the culture, but the neutrality of being a proud New Zealander since 2001. ‘Oh, Kiwi, welcome!’ was the typical response from most of his subjects. Their portraits were taken using a loan camera without any posing, special lighting, or even a tripod. Wittenberg is no stranger to accolades, winning the 2015 New Zealand Institute of Professional Photography Auckland Photographer of the Year award and recently also the 2016 title. His achievements are all the more impressive given that Wittenberg’s photographic journey began in 2011 after a career in business, backed by engineering and MBA degrees. We look forward to more candid pictures from a master portrait photographer. For more of his work, check out his online portfolio.